Simon Peter, Thomas called the Twin, Nathanael of Cana in Galilee, the sons of Zebedee, and two others of His disciples were together. Simon Peter said to them, “I am going fishing.” They said to him, “We are going with you also.” They went out and immediately got into the boat, and that night they caught nothing. But when the morning had now come, Jesus stood on the shore; yet the disciples did not know that it was Jesus. And He said to them, “Cast the net on the right side of the boat, and you will find some.” So they cast, and now they were not able to draw it in because of the multitude of fish. Therefore that disciple whom Jesus loved said to Peter, “It is the Lord!” Now when Simon Peter heard that it was the Lord, he put on his outer garment (for he had removed it), and plunged into the sea. But the other disciples came in the little boat (for they were not far from land, but about two hundred cubits), dragging the net with fish. 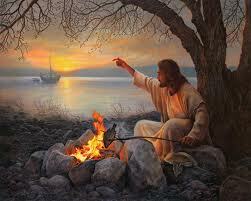 Then, as soon as they had come to land, they saw a fire of coals there, and fish laid on it, and bread. Simon Peter went up and dragged the net to land, full of large fish, one hundred and fifty-three; and although there were so many, the net was not broken. Jesus said to them, “Come and eat breakfast.” Yet none of the disciples dared ask Him, “Who are You?” — knowing that it was the Lord. Sometimes, God’s way for us is kind of weird and doesn’t make any sense. Just like in this chapter; the boys were all out for that night but they came back to the shore with empty hands. A total waste of energy and time. But then there was a Stranger told them to throw the net near the shore. If we think about it, in order to catch a lot of large fish we need to go a lot further into the sea. But the Man told them to throw the net near the shore, and they caught 153 large fishes. Secondly, from verse 11, we know that they got 153 fishes. Before, they brought out empty net; but then after the Man asked them to throw the net near the shore, large fishes were caught. What I got from this is that God is there with them in Tiberias. God is there with the boys when they were having a tough daily life. God is there with us. He is Immanuel remember? Thirdly, what I got from this chapter is that the first one to recognize the Stranger as Jesus Christ is the beloved disciple of Jesus Christ. And so, in order for the veil in our eyes that prevent us to see the glory of God with all the wondrous works in our lives to be opened and so that the Kingdom of God be revealed to us, we need to be intimate with God Himself. With Lord Jesus Christ. To be intimate can also mean to become one with Him. He lives in us and we lives in Him, His Word lives in us and whatever we asked in our prayers will be granted by the Lord. In order for this to happen, we need His sacrifice. We need His Flesh and Blood, for His Flesh is real food and His Blood is real drink.